According to the biblical book of Jonah. God told Jonah to go to Nineveh and tell its inhabitants that they had sinned. 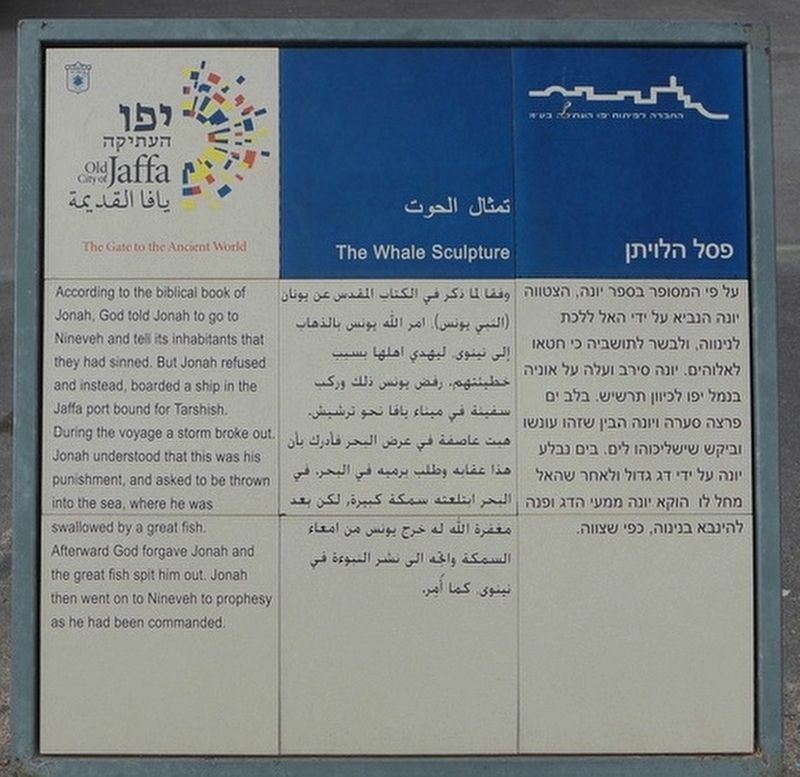 But Jonah refused and instead, boarded a ship in the Jaffa port bound for Tarshish. During the voyage a storm broke out. Jonah understood that this was his punishment, and asked to be thrown into the sea, where he was swallowed by a great fish. Afterward God forgave Jonah and the great fish spit him out. Jonah then went on to Nineveh to prophesy as he had been commanded. Location. 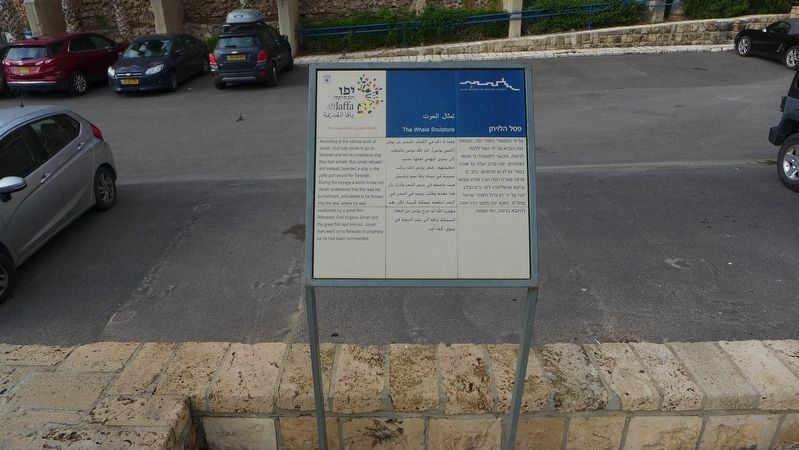 32° 3.17′ N, 34° 45.113′ E. Marker is in Tel Aviv-Yafo, Tel Aviv District, in Jaffa. Marker is on Louis Pasteur Street just east of Ha-Migdalor Street, on the right when traveling west. Touch for map. 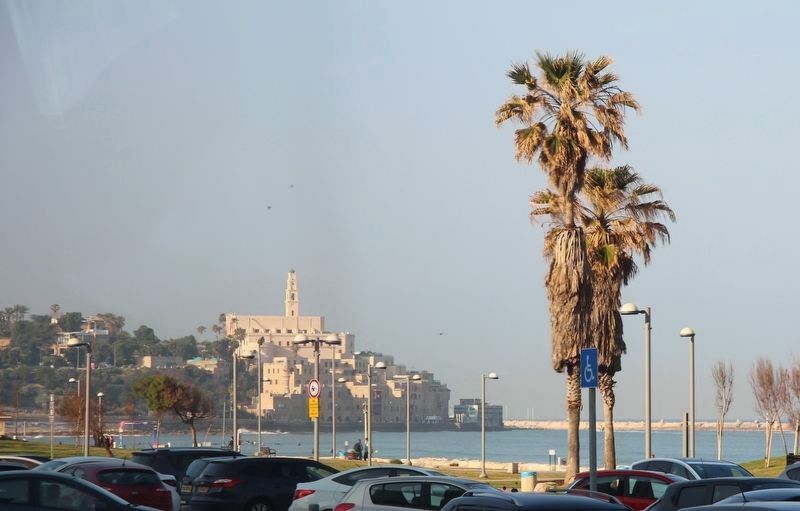 Marker is at or near this postal address: Louis Pasteur Street 8, Tel Aviv-Yafo, Tel Aviv District, Israel. Touch for directions. View of the marker, situated in a small park, near a parking lot. (approx. 17.8 kilometers away in Central District); Tel Afeq - Antipatris (approx. 17.8 kilometers away in Central District); The Roman Cardo (approx. 17.8 kilometers away in Central District). More about this marker. 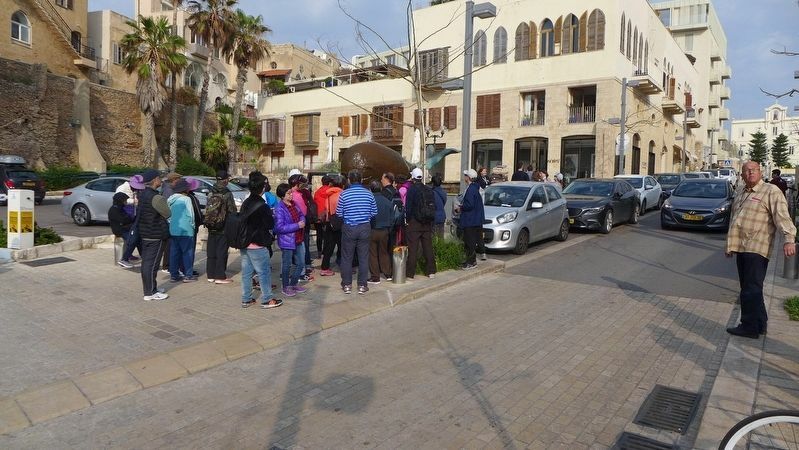 In 2019, because I traveled to Israel as part of a tour group, taking pictures of historical markers and recording location information for each marker that I photographed was a difficult assignment. Then too, having two bad knees and walking with a cane made keeping up with my tour group, much less recording location information as well, even more difficult. So I am using my Google Map skills, from at home, to provide the needed location information and map coordinates. Anyone that visits these markers is welcomed, and encouraged, to improve on the provided information. View of the Whale Sculpture that is featured on this marker. Distant view of both the marker (right center) and the Whale Sculpture (center). View of a group of tourists gathered in front of the Whale Sculpture. 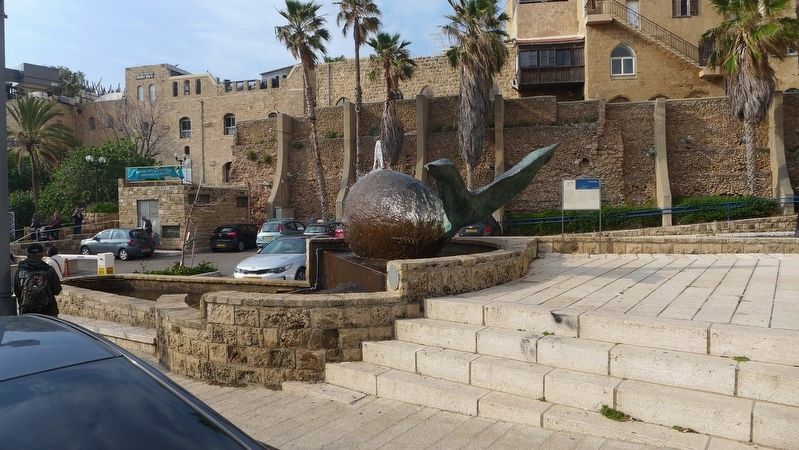 This marker is located in the old port city of (Biblical) Jaffa. More. 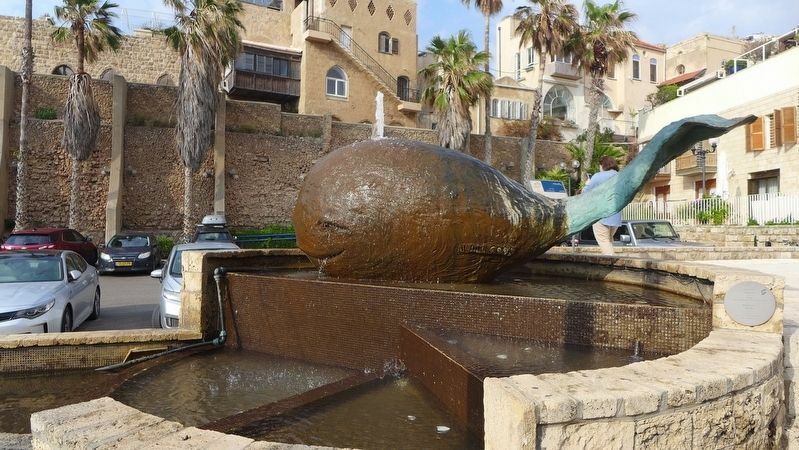 Search the internet for The Whale Sculpture. Credits. This page was last revised on April 18, 2019. This page originally submitted on April 17, 2019, by Dale K. Benington of Toledo, Ohio. This page has been viewed 49 times since then. Photos: 1, 2, 3, 4, 5, 6. submitted on April 17, 2019, by Dale K. Benington of Toledo, Ohio.